A magnificent and vast display of cloud streets was photographed by NASA’s MODIS satellite this month.Â The display was particularly vibrant, with clouds lining up in rows — or “streets” — for hundreds of miles.Â These north-to-south oriented rows were caused by an unstable layer of air beneath a more stable layer in the upper levels of the atmosphere. The best setup for cloud streets is when the lowest levels of the atmosphere – the layer closest to the ground – is unstable.Â A layer of air is unstable when the lowest levels of it are warmer than the air immediately above.Â This difference in temperature causes the lowest levels to want to rise.Â Think of the steam that rises out of a pot of boiling water.Â When this warmer air rises, it cools and the moisture within it condenses into cloud droplets.Â This is the same process that forms all clouds. 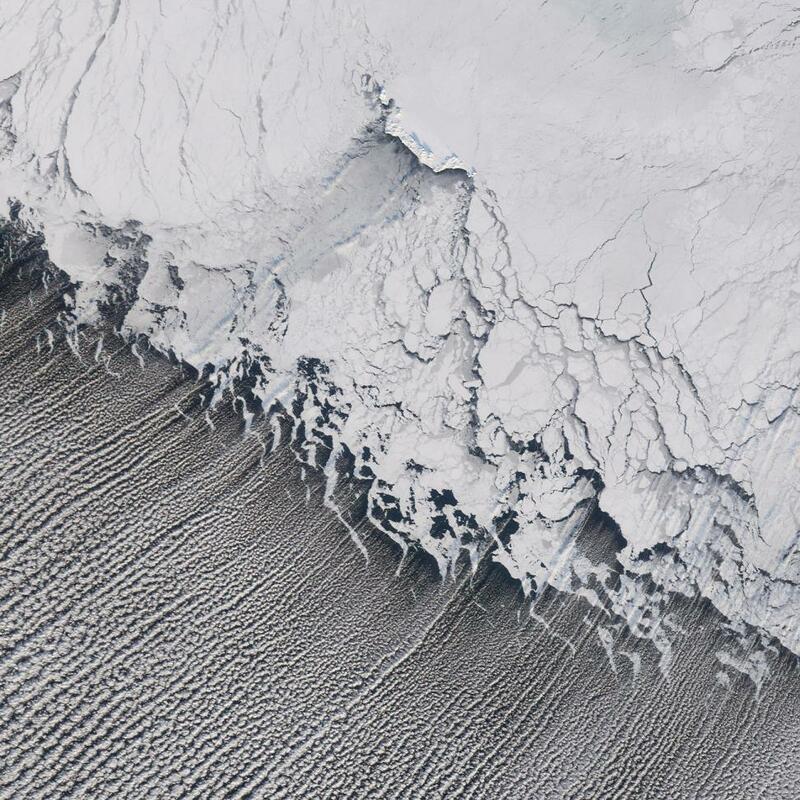 This image of cloud streets is a particularly poignant example of how well-defined the boundary can be between the rising motions (forming the clouds) and the sinking motion (clear air). This image shows cloud streets as viewed from a plane flying just above the unstable air and within the inversion layer. 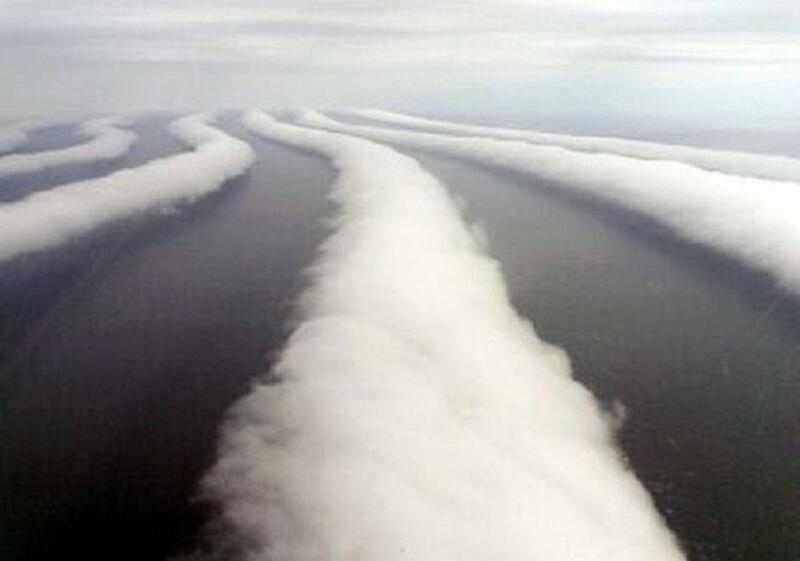 The difference that enables cloud streets to form is that this unstable layer is covered by a stable layer of air, sometimes called an inversion.Â This stable air is essentially a layer that is slightly warmer than the air at the surface and as such, does not allow the unstable surface air to rise through it.Â This is like having a lid on the pan of boiling water.Â As such, the rising motion generated by the lower unstable layer is capped and is prevented from rising higher.Â The rising air then spreads out horizontally and cools.Â As it cools and becomes cooler than the environment, that air then begins to sink.Â This sinking air is what causes the clear air rows between the clouds. The formation of cloud streets begins with a low-level unstable layer of air (shown by red) that rises, cools, and condenses to form clouds. This air then cools and descends (blue), generating the alternating rows of clear air. This cycle of rising and sinking air creates a small “rotor” whereby some air rises and condenses into rows of clouds and other air sinks, generating the alternating rows of clear air. The wind at the surface generally flows parallel to the ‘streets’, as shown by the yellow arrow above. One of the most frequent locations where cloud streets are seen is over open water.Â Particularly when cold air invades land, such as over continental land masses in the fall months, this cooler air flows off the coast and over much warmer ocean waters. 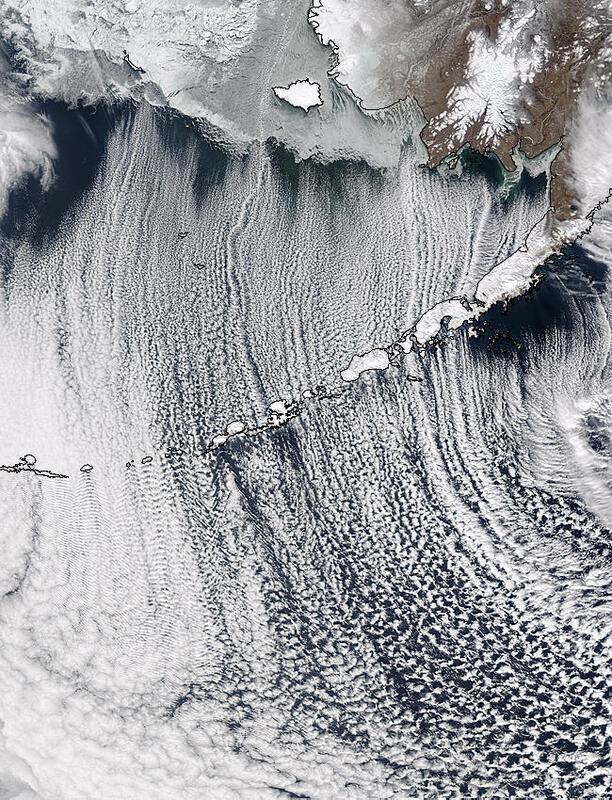 Cloud Streets form over the Bering Sea as cold air flows from over the snow-covered continental surface (white land mass) and over open ocean waters. The open ocean waters warm the air from beneath, causing rising motion that cools the air, condenses the water droplets, and forms clouds. 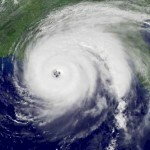 Image Source: NASA MODIS. 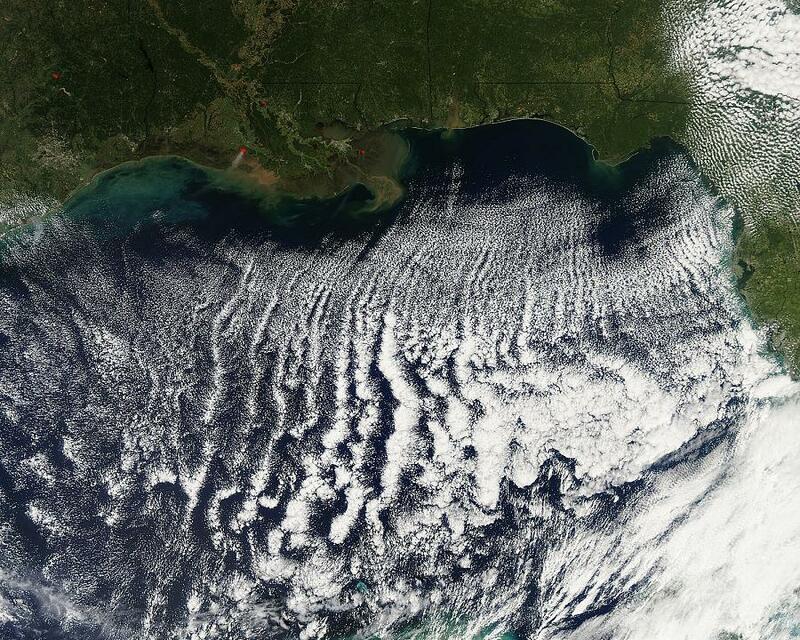 When the cool air flows over the warm ocean waters, the air is warmed from beneath, causing it to rise.Â As the air rises, it runs into the inversion layer – the cap – and is forced back down.Â This cyclical motion causes the rows to form as evidenced by several images of cloud streets forming over the Gulf of Mexico or the open ocean south of Alaska during the fall months. Cloud streets can be significant not just for their majestic beauty as viewed from either the surface of the earth or from hundreds of miles above the surface via satellites or other spacecraft. Cloud streets can also provide a very visual depiction of locations of rising air versus sinking air.Â This visual cue can be useful for airline pilots who need to be aware of the rising/sinking motions within unstable air masses.Â Additionally, recreational pilots can use the visual cues generated by cloud streets to maintain lift for many miles.Â When glider pilots can see where the rising motion is located, they can often ride these streams of thermal currents for miles, all the while continuing to rise. I believe this report is a “”set up”” done to offset clames that the earth”” is”” being sprayed on a daily basis around the globe with “”airosol polutants”” to create conductivity in our air to enable geoengineering of our weather to take place as has been the case for over a decade in some parts of the world. This enables the powers to be to continue programs in our air space with a “”made up scape goat to hand “”to offset claims of weather modification and control done by chemical spraying known as CHEMTRAILS. I believe this report should be removed from this site as bogus lieing rubbish . People who have lived decades on this planet and observed the sky now and for thousands of years, are now being shown via this site a format in our sky that did not exist prior to the late 1990’s. “”Everyone”” should sit up and take note that trails shown on this page are “”man made”” via high flying planes that can and have been filmed doing the “”” dirty work “””on a daily bases around the globe with devistating affects to our weather and sky clarity. Your ignorance is the driving force that enables this program to go unchecked. Please go and watch the documentary “”WHAT IN THE WORLD ARE THEY SPRAYING””have local soil and water samples tested for polutants and collect your rain water for testing. To ignore your own safety is what they want, to believe fancy pictures and made up theory such as are shown in this report is living in a fools paradise. This is a set up to disclame chemical spraying of our air space !!! I think it was a set-up designed to bring the CON-Theorists out of their mouse-holes, with an article containing such content that there would be no possible way for them to NOT make their ignorance of reality public. This is done quite often really, and it never fails to stoke the VERY active imaginations of those CON-Kiddies. And a secondary benefit is that it gives those of us who actually DO understand the subjects we comment on a welcome dose of pure entertainment. Some of these CON-Dudes can invent & elaborate on some VERY funny fairy tales. Give it a try. You’ll be amazed just how rewarding it is to actually do some thinking for yourself, rather than just repeating copy-and-paste crap from some CON-Site operated by a pair of kid-brothers who have just entered puberty. I never have been able to fully understand why some people …. LOTS of people …. purposely & completely wreck any credibility they once may have had by willingly letting themselves be associated with the type people & sites which have rapidly became the web’s greatest source of ignorance & laughs. Certainly not too concerned about being taken seriously, are these people who get their ideas & instructions from sites so hugely & laughably out of touch with reality. And with that one sentence, 99% of all web-sites containing the word “Conspiracy”, plus the clueless non-thinkers who are so naive enough to actually believe what is published on those sites, have been perfectly explained. And since the ones who believe all this obviously bogus trash do so almost religiously, I bet it’s safe to say that a large percentage of them ALSO believe every single article printed in the “Weekly World News” & “National Enquirer” type of trash-tabloids. And THAT is even MORE hilarious than anything else the Clueless-Crowd could possibly pull out of the rabbit-hole. Good grief, it is so much easier to believe in conspiracies than it is to study meteorology? It’s a fantastic natural world out there – have a look at it. Could street-like patterns were known before airplanes existed. Maybe the British Navy of the 1800’s was blasting the sky with cannons? I would not be surprised to see that explanation next.